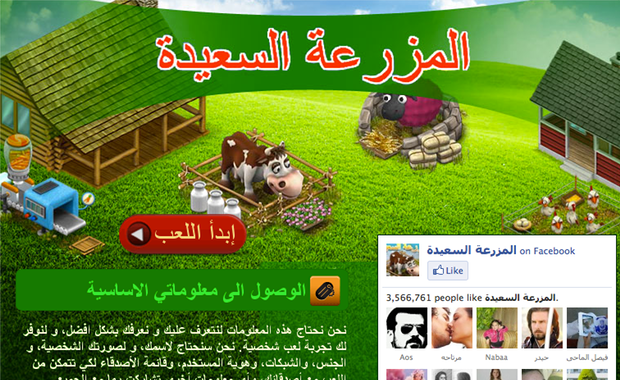 Happy farm an Arabic social game (similar to farmville) on Facebook published by Peak Games has been on the top gaining applications list for a while and its ranked number 14 as the top gaining application adding another 200,000 Daily Active Users (DAU) since last week according to Appdata. The numbers are impressive and growth doesn’t seem to be slowing down. Clearly there’s a market for social games in the region but why aren’t there more Arabic games catching on? Is it the lack of ideas? Talent? Marketing? Understanding social media? Whatever the reason, I’m pretty sure that there is money to be made in this industry especially where virtual goods are sold. But I just can’t wrap my head around why there aren’t anymore Arabic games! Peak Games, by the way, is a company that focuses on games in emerging markets, if you visit their website you’ll find out that they have a number of games in Turkish (but Happy Farm is by far their most successful app) and according to their website they have offices in Turkey, Jordan, Spain and Germany. So maybe it is a question of talent and that there aren’t many qualified game designers in the region.